Can the additional bad publicity from Corporate Scandal be removed? No. The Corp is considered to have an additional bad publicity, even when they have none, but it does not exist for the purposes of being manipulated (such as removing it). The Corp has 0 bad publicity when the Runner plays Corporate Scandal. The Corp plays The All-Seeing I. Can the Runner remove the additional bad publicity from Corporate Scandal to prevent all resources from being trashed? No. The additional bad publicity that the Corp is considered to have cannot be removed, so the Runner does not have the option to remove it in order to prevent the trash effect. The Corp has 2 bad publicity when the Runner plays Corporate Scandal. The Corp installs an Exposé, advances it twice, and uses its ability. How many bad publicity tokens does the Corp have after using Exposé? Later, the Corp scores an agenda. How many bad publicity tokens does the Corp have then? The additional bad publicity that the Corp is considered to have cannot be removed. When the Runner plays Corporate Scandal, the Corp has 2 bad publicity tokens and is considered to have an additional bad publicity. After using Exposé, the Corp has no bad publicity tokens but is still considered to have an additional bad publicity. 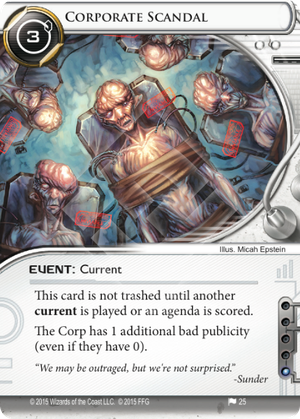 After scoring an agenda, the Corp still has no bad publicity tokens and is no longer considered to have any either. A lot of people aren't really liking this card, particularly with the one influence cost. As Zakalwe points out, if you're only making a run or two per turn, Net Celebrity pays off much faster. So what gives? They're missing something significant. Bad publicity scales quadratically. Bad publicity gives you a discount on every run you make. Increasing the amount of bad publicity you have means that you both save more per run, and runs are cheaper, letting you make more of them. Consider this. The corp has a single Eli 1.0 protecting R&D, and you have a Corroder or Eater and a Keyhole. You just played a Day Job and have 10 credits and want to hammer R&D. How many times can you hit it before needing to click for credits? 0 bad pub: it costs you 4 each run, meaning you only get two runs (with 2 left over). 2 bad pub: At 2 per run, you can hit R&D five times before needing more funding. 3 bad pub: Ten credits at 1 per run is ten runs. 4+ bad pub: Running is free, bro. Unlimited Keyhole-ing. Do you see what happens there? Going from 2 per run to 1 per run doubles the number of runs you can make. This is where Corporate Scandal is strong--when you are just piling on bad publicity and walking through ICE like it isn't there. Obviously, this is strongest out of Valencia--she starts with one bad pub, which turns on Investigative Journalism, and then between Frame Job+Fan Site and Corporate Scandal you can get yourself to 3-4 bad publicity without much effort. More than that if they're running Hostile Takeover or illicit ice like Grim. Of course, you need to have a way to make productive runs. Trashing assets is a good start: remember that you can use bad pub money during runs on unprotected servers to trash those Museums and Mumba Temples and Pālanā Agroplexes. Hitting HQ repeatedly with a Lamprey installed can be mean. Keyhole as I mentioned above. Or get something with instant-speed installs like Self-modifying Code, Clone Chip, Personal Workshop, or Savoir-faire and use bad pub during runs as your personal bankroll. Why not? Really, the greatest downside to this card is that you can only play one current at a time, which means you have to choose between this and Itinerant Protesters. Which is better: having 3 bad pub and forcing the corp down to two cards in hand, or having 4 bad pub? Depends on the board state and the matchup, I guess. The point is, don't knock it until you try it. Valencia has many more tricks up her sleeve than just Blackmail. Corporate Scandal can be a great support card for Valencia Estevez: The Angel of Cayambe decks that rely on Blackmail. Given that Corporations have BP removal cards such as The All-Seeing I, Rex Campaign, Clone Retirement, Elizabeth Mills, Veterans Program, Witness Tampering or Exposé. For decks that don't rely on Blackmail the closest comparison would be to the current Net Celebrity. Net Celebrity costs just 1 but it only works once per turn. Corporate Scandal on the other hand costs you 3 and works for every run you make. Both cost a to draw and a to play, so assuming 1 = 1 it takes 3 runs over 3 turns for Net Celebrity to pay for itself and it takes 5 runs for Corporate Scandal to pay for itself. Considering Corporate scandal is a 1 influence neutral card it does not seem to pay at all for Shaper decks. Corporate Scandal can be very useful if you play Valencia or some other type of BP reliant deck, but not particularly helpful otherwise.